The latest line of gluten-free products from Colorado's Boulder Valley comes from Rudi's Bakery. Long known for its organic baked goods, Rudi's has entered the gluten-free market with three breads: Original, Multigrain and Cinnamon Raisin. Unlike Udi's breads, those from Rudi's don't hold up well at room temperature; the honey-sweetened Original and nutty Multigrain varieties we tried didn't match that Udi's fresh-bread-style softness even after defrosting. (The company suggests storing the breads in the freezer.) Where Rudi's does shine, however, is out of the toaster. The heat brought out the breads' flavors, making for a delicious breakfast side. Also in Rudi's favor is the size of the slices. While Udi's are somewhat diminutive, Rudi's slices - 14 per package - are much more comparable to that of a typical sandwich bread. The all-natural breads, made primarily with potato extract, rice starch, and rice and sorghum flours, are certified by the Gluten-Free Certification Organization. As part of the certification, every batch of bread is tested and must test below 10 ppm of gluten for distribution. Egg is the only allergen listed on the ingredient labels, and the breads are Kosher Parve. 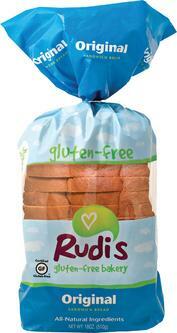 Rudi's breads are making their way to stores now. In the meantime, they can be ordered online directly from the company by the 8-pack case for $5.35 a loaf plus shipping. DISCLOSURE: While Rudi's provided product samples for me to review at no cost, such compensation did not influence my review. Neither I am nor any immediate family member is an employee, officer, director or agent of Rudi's or its respective parent, subsidiary and affiliated entities, advertising and promotional agencies. Click here for my complete Disclosure. Hey, Mike – thanks for trying and reviewing Rudi’s new Gluten-Free Bread. While I was pleased to hear that the bread was good toasted, I was disappointed to learn that it didn’t hold up well under other conditions. Would you be open to giving it another chance? We have had some shipping problems that caused some our loaves to be drier than usual. I’m not sure if that was the case here, but if it was, I’d love for you to give it another try. Just let me know! Also, if you’d like to let a few of your readers judge as well, I’d be happy to send them a few loaves to taste. Just send me their addresses. In the meantime, try this recipe for Rudi's Gluten-Free Bakery Gourmet Grilled Cheese and Tomato Jam. It was created by Chef Justin Cucci, owner of Denver's Root Down Restaurant, and it is delicious!